The latest effort by Senate Republicans to dismantle large portions of the Affordable Care Act could challenge Indiana’s ability to care for low-income Hoosiers, some health experts say. “The repeal would arguably be the beginning of the unraveling of the safety net,” said Dr. Lisa Harris, CEO of Eskenazi Health, during a panel discussion Thursday morning at IBJ's Health Care & Benefits Power Breakfast. Eskenazi takes mostly poor and underserved patients, and has been able to treat many more low-income patients since the state rolled out its version of Medicaid expansion, called HIP 2.0, in 2015. That move added more than 400,000 Hoosiers to health insurance rolls and earned strong bipartisan support in the Indiana General Assembly. Now, if Congress passes a bill called Graham-Cassidy, which would replace federal funding with block grants to states, Indiana could lose up to $7 billion in health funding between 2020 and 2027, according to a study by the consulting firm Avalere Health. That would probably mean less money to cover low-income Hoosiers, who use HIP 2.0 or receive federal subsidies for the health exchanges, said Kevin Woodhouse, a partner at Ice Miller and chair of its health law practice group. “It will be a challenge to meet the funding gap in Indiana, but there are motivated partners to do it,” he said during the panel discussion. Senate Majority Leader Mitch McConnell has said the matter will likely come to a vote next week, but did not say whether Republicans had the necessary 50 votes to pass the measure. Republican efforts earlier this summer to repeal the Affordable Care Act failed. Over the summer, as Congress was considering other repeal efforts, Indiana hospital officials sounded the alarm that dismantling funding for HIP 2.0 would cut heavily into their ability to serve low-income patients, and would take a bite out of revenue. At Community Health Network, reimbursements from HIP 2.0 added up to $49 million last year, or about 9 percent of the health system’s business—up from about 6.5 percent a year earlier. 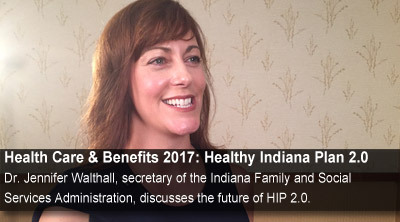 At Indiana University Health, the state’s largest health system, HIP 2.0 accounted for 6.4 percent of gross patient service revenue last year, up from about 1 percent in 2014, a year before the program expanded. Many big players in health care are calling for Congress not to pass the Graham-Cassidy bill, saying it would result in millions of Americans losing their health insurance coverage and would destabilize insurance markets. The bill's opponents include the American Medical Association, the American Hospital Association, the nation's largest health insurers and the AARP. Yet some Indiana officials are pushing Congress to pass the bill. Gov. Eric Holcomb on Tuesday joined 14 other Republican governors in backing the Republican effort. An official with the Indiana Family & Social Services Administration, which administers the state’s Medicaid program, declined to predict whether the repeal effort would pass, but acknowledged there would likely be a funding gap if it did. She did not offer specifics, but in an interview after the panel discussion, she repeated that the state would work to adjust. Terry Stigdon, clinical director at Riley Hospital for Children, pointed up the need to constantly review operations to make money go further to provide care. “We need to be smarter and efficient as health care systems in using the money we have,” Stigdon said during the panel discussion. Ben Evans, CEO of OurHealth, which provides on-site clinics for employers, said providers must be creative in finding ways to provide access, especially with a looming doctor shortage. “Access to health care must be protected,” he said.